Ceire qualified from Queens University , Belfast in 2006 with distinction . She has worked in Scotland since then in general practice. She comes to our practice with a wealth of experience having worked in mainly private dental practice. 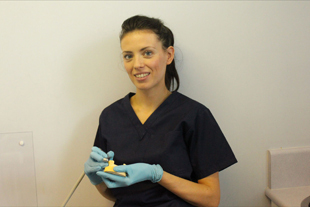 Ceire aspires to work at a relaxed pace providing patients with high quality dentistry and very much enjoys transforming smiles and seeing patients leave with a new found confidence.Ceire works full time. She too has a full continuing professional development portfolio. To make an appointment with me for an examination or check-up, use our simple online booking system.